Details have been limited but not scarce following the 7.1 magnitude earthquake  which struck Qinghai province at 7:49 am Wednesday; in addition to 400 confirmed deaths , at least 10,000 others were injured. Reportedly, more than 25 aftershocks continued to hit the already devastated  area throughout the day, including one of magnitude 6.3 at 9:25 am. Media both in Qinghai  and nationwide were quick to report on relief efforts and saw major Internet news portals such as Netease  providing ongoing coverage, with Tencent  seeming to have the most current information with its growing page of live updates. Phone companies have pledged to keep mobile service running  regardless of any unpaid balance. With Hu Jintao still in America, Vice Premier Hui Liangyu was early  at the scene to command efforts. Relief work is being hampered by the remote location and high altitude of the epicenter, currently also experiencing sandstorms and below-zero weather ; army officials have been frank  about the challenges faced by rescue efforts due to lack of appropriate equipment in the area, with local police stating that while people are still alive in the rubble, they will have to be dug out by hand . At least one school dormitory collapsed  during the quake, killing 56 children; another school in Yushu collapsed, trapping 30 students who still stood chance of being rescued according to  one Sina news report. A spokesperson for the Red Cross Society of China has said that 70% of schools  in the area have collapsed. 1. There are no tofu-dreg buildings ; 2. The victims are emotionally stable; 3. Out-of-province media are not allowed in for interviews; 4. All reporting must use Xinhua bulletins; 5. The names of the dead will not be made public; 6. People  who make claims  of tofu-dreg schools are guilty  of state subversion; 7. Experts will once again explain why earthquakes cannot be forecast; 8. News reports of experts who in just March stated that destructive earthquakes would not take place again will disappear. Columnist and Twitter addict Lian Yue has been looking deeper, noting a promise  made by Premier Wen Jiabao during his work report to the 2009 NPC  that schools from across the country would be inspected and safety standards enforced, and finding that 15878 individual buildings belonging to the more than 8000 schools in Qinghai province underwent safety appraisals, the results of which were released last October. 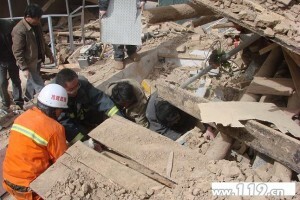 Twitter user nwau looks even closer still, at Qinghai government school building safety working group reports , the Yushu government's official response measures  in cases of emergency situations, and wonders  about the fate of schools in the area which began construction last summer. 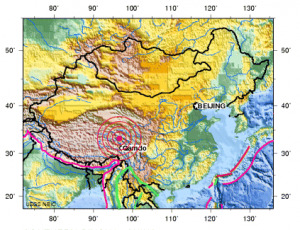 Leading up to midnight Wednesday, reports came that several dozen mainstream media reporters en route to Yushu were stuck  at Wuhan's Tianhe Airport, coming at the same time as news that checkpoints have been set up  as far away as 80 km from Yushu, a mainly  ethnic Tibetan area, and that journalists specifically are already being refused entry  into the quake zone. While this seems to contradict a call for “all-out efforts”  put out by both Wen Jiabao and Hu Jintao, it's not the only sign that harkens back to the 2008 Sichuan earthquake ; not long after Qinghai Vice Governor Jidi Majia put out a call  for stronger “proper” guidance of public opinion, journalists on Twitter and other microblogs began reporting  that a blackout had been issued regarding news of the quake barring out-of-province media from entering the area or conducting interviews . At the same time, however, Baidu's Qinghai section  reopened at just after 12 pm on Wednesday following its closure on March 18, 2008 , although earlier in the morning some had observed  Baidu to be blocking any searches for information regarding Qinghai. A Twitter account was set up which is posting all messages or reports  sent to a designated phone number that was spread widely around today, and others began aggregating  tweets with various details of latest developments. Threads on different BBSes and blogs began collecting first-hand photos from Yushu, and a number of people began organizing  their plans to travel to Yushu through the use of tools like Twitter. Spontaneous efforts to organize have appeared on major BBS site Tianya , where pages had also been set up to help collect donations . As was seen during the 2008 Sichuan earthquake, web companies have offered to contribute financially as well; Tencent, for example, with a pledge of RMB2 million  and a form encouraging its users to donate. China's religious communities are also going online  to raise donations and support for relief efforts.